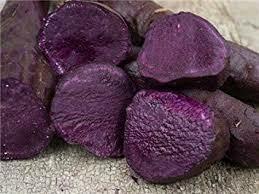 Sweet Potatoes - Hawaiian Purple - Organic - lb. Organically grown Hawaiian purple sweet potatoes. Purple skin with deep purple flesh. This means they are high in anthocyanins which are anti-oxidants that help our bodies rid us of free-radicals that damage the body. Less sweet then our Georgia Jet orange variety so they are less glycemic which means they don't spike the blood sugar like the orange variety. Dandelion - Organic - Greens - 4 oz. Moringa Leaf - Organic - Dried - 1/2 oz. Pumpkin Seeds - Raw Shelled - Organic - 12 oz.